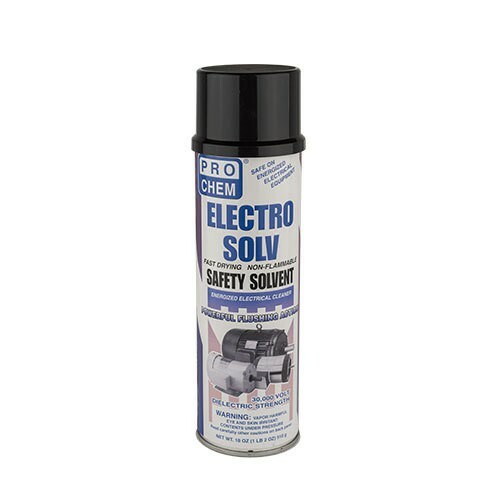 ELECTRO SOLV | Pro Chem, Inc.
ELECTRO SOLV is a fast drying, nonflammable, solvent cleaner and degreaser spray. 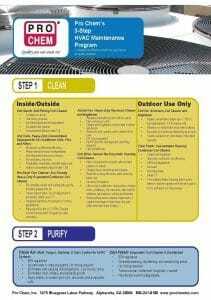 It contains trichloroethylene, an accepted replacement for 1,1,1 Trichloroethane under the EPA SNAP program. Powerful flushing action penetrates through and removes grease, grime, dirt, tar, wax and other contaminants. The dielectric strength and nonflammability of the product allows it to be used on electrical equipment and machines, even while energized. Dries fast and residue free. ELECTRO SOLV features a dual spray valve, which eliminates the need for extension tubes. Saturate part to be cleaned. Wipe or allow to air dry. For heavily encrusted areas, brush, then rinse off with a second application. May remove some paints, pretesting is suggested. Note: Energized equipment use only. Do not use on motorized vehicle maintenance and solvent sensitive plastic surfaces or materials. May remove some paints. Always test first on scrap material or on a small inconspicuous area. Tilt forward for jet stream that shoots 8 feet to reach remote objects and small devices. Push down for regular spray to cover surface areas.